A non-cycling cow is one that hasn’t been seen to be in oestrus (heat) either before, or within the early mating period. These cows may be suffering from a condition called Postpartum Anoestrus, or may be having silent heats (are in oestrus, but not showing any signs of it!). These cows can present a large proportion of cows within herds in this district, with on average, between 20-40% of cows in herds being presented for non-cycling treatment. Given non-cycling cows often have poorer reproductive performances relative to herd mates, and higher input costs associated with treatments, trying to prevent cows from becoming non-cycling cows should be at the forefront of preventative management for dairy farmers. Why is she a non-cycler? There are a number of ‘risk factors’ for why cows might require treatment for non-cyclicity, including age, time since calving, disease around calving, and perhaps most importantly, body condition. Body condition in early lactation is highly likely to impact a cow’s risk of being treated as a non-cycler as well affecting her chance of conceiving in the early mating period. 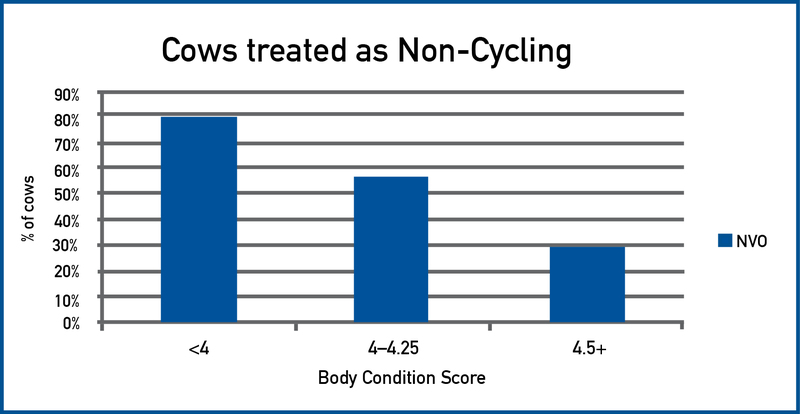 Body Condition Score (BCS) in Australia is measured on a 1-8 scale and is used as a means of assessing the nutritional status, or energy balance, of an individual cow. It can also be used across a herd, to establish the overall nutritional and energy status of a herd. The BCS can tell you a lot about the previous levels of feeding, as well as likely future production and feed requirements. Cows inevitably lose body condition post calving to enable them to meet the demands of lactation through mobilization of body fat for energy. It is often impossible to prevent this body condition loss in the early period post-calving. Because of this, it is very important to ensure that cows are dried-off and calve in adequate body condition to allow for this loss in the early lactation period. It is recommended that cows calve in BCS 4.5-5.5, and lose no more than half a BCS prior to mating to improve the chance of reproductive success. It is important to note, that cows being either too skinny (less than 4), or too fat (greater than 5.5) at calving can both have deleterious effects on reproduction as well as production, so it is a matter of getting it just right! As part of the research project being completed currently, 80% of cows that were in body condition less than 4 at the start of the mating period required treatment as non-cycling cows. This is in comparison to cows in body condition greater than 4.5, of which only 30% required treatment for being non-cycling. This is a very important finding and highlights the importance of ensuring adequate body condition, not only at the start of mating, but at dry-off and at calving. First calving heifers are more likely to require treatment as non-cycling compared to older animals and this is due to a number of factors but mainly being the increase in energy demand for continued growth as well as lactation that they endure. Social stress (establishing a hierarchy) also impacts first calving heifers and may affect their ability to show heat. The time since calving also impacts the likelihood of a cow being treated as non-cycling, as it takes time for the uterus to return to a normal size and function after calving. It also takes time for the hormones that are involved in cycling and ovulation to return to normal levels. Cows in early lactation are also under a lot of nutritional stress, and they are often unable to meet the energy demands of lactation. This negative energy balance can impact the normal secretions of hormones that are required for a cow to cycle and ovulate, so the longer a cow has been calved, the more likely she is to be in a positive energy balance. The post-calving period is a fairly risky time for a dairy cow, and diseases such as milk fever, retained foetal membranes (RFMs), Metritis, Endometritis, Ketoacidosis, and Displaced Abomasums (LDA’s and RDA’s) are all likely to impact their ability to cycle. Therefore disease in early lactation can increase the risk of a cow being treated for being non-cycling. Overall, ensuring cows are in good health and body condition when they are dried off, maintaining them in good condition through the dry period, and combining this with an effective transition management program, is all essential for future reproductive performance and will reduce the number of cows requiring treatment as non-cycling cows.